Trump's evidence? A 14-year-old photo of Schumer and Putin holding coffee and doughnuts in a New York City gas station. NEW YORK: President Donald Trump, his administration under siege for contacts with Russian officials, is calling for "an immediate investigation" into Senate Minority Leader Charles Schumer's own ties to Russian President Vladimir Putin. The president on Friday tweeted a photo of the two men, calling for a probe into Schumer's "ties to Russia and Putin" and called the New York senator "A total hypocrite!" 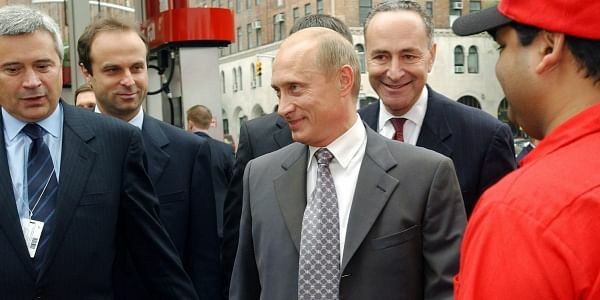 Trump did not say where the photo came from, but Schumer quickly pointed out that it was taken in 2003 when Putin ventured to New York to celebrate the opening of a Russian-owned Lukoil gas station on Manhattan's west side. Several news organizations covered that event, which drew far more political star power than the average gas station opening. Schumer, in his own tweet, said he would "happily talk" under oath about his meeting with Putin, which took place "in full view of press and public." He then challenged Trump to do the same. And, a short time later, he posted a follow-up in which he further poked fun at the photo, noting "And for the record, they were Krispy Kreme donuts." On the same trip to the United States in 2003, Putin traveled to Camp David, Maryland, where he met with Republican President George W. Bush and the two held a joint news conference. Trump's tweet came just hours after the conservative website Drudge Report made the photo its lead image. And that was a day after the photo was unearthed by the pro-Trump blog Gateway Pundit, which ran it with the headline "Where's the outrage?" Trump targeted congressional Democrats for their encounters with Russians over the years even though the party's criticism of Attorney General Jeff Sessions centered on his failure to acknowledge his meetings when questioned at his Senate confirmation hearing and in written responses to the Judiciary Committee. "I think he was asked a pretty straightforward question at his committee hearing and I do think he should resign," Sen. Bernie Sanders, I-Vt., said in an interview. Trump also tweeted Friday about House Minority Leader Nancy Pelosi, who was among the first to call for Sessions to resign. In his tweet, Trump linked to a 2010 photo in which Pelosi and other lawmakers, including Rep. Mac Thornberry, R-Texas, now the chairman of the House Armed Services Committee, are shown meeting with Russian officials, including then-President Dmitry Medvedev and Ambassador Sergey Kislyak. Trump demanded an investigation of the House minority leader. Pelosi had initially denied ever meeting Kislyak; her spokeswoman later clarified that they never had a one-on-one meeting. Pelosi then needled Trump by saying he didn't "know the difference" between an official meeting photographed by the press and a "secret" meeting that Sessions "lied about under oath." It is not improper for elected officials to meet with foreign diplomats. Trump's White House has been battered by questions about his links to Russia, quashing any sort of political momentum he had earned from his highly praised address to Congress earlier this week. Sessions on Thursday said he would recuse himself from Russia probes after it was revealed that he had conversed with Russia's ambassador twice during last year's campaign, a contradiction of his testimony during his Senate confirmation hearings. But that move has not satisfied many Democrats, who have called for Sessions' resignation. They also demand an independent investigation into the Trump campaign's ties to Russia. Several other Trump allies have also faced questions about their ties to Russia, including former national security adviser Michael Flynn, who was ousted last month for misleading White House officials about his conversations with Kislyak before Trump took office.